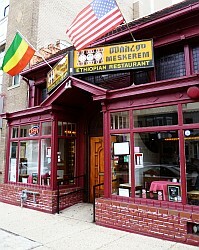 The Meskerem restaurant offers Ethiopian cuisine at 2434 18th St. NW in Washington, DC 20009. The restaurant is open for dinner Monday through Thursday, and it is open for lunch and dinner on Friday, Saturday and Sunday. 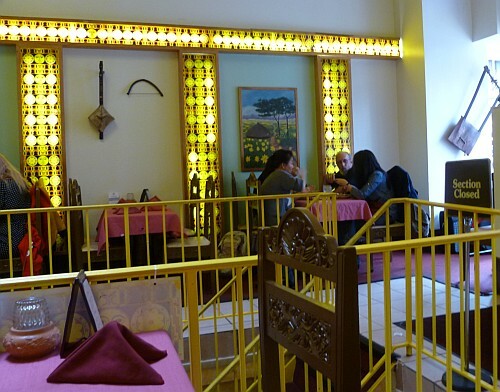 The Meskerem restaurant has tables on the ground level and in a lower level. There are also a few tables on platforms adjacent to the large windows in the front of the restaurant where you can see passers by. The traditional Ethiopian bread, injera, is part of every entrée. The injera is a large crepe upon which the various dishes are served. Bite-sized pieces of injera are broken off and used to grab a portion of the entrée. No utensils are used. You have to use your hands. 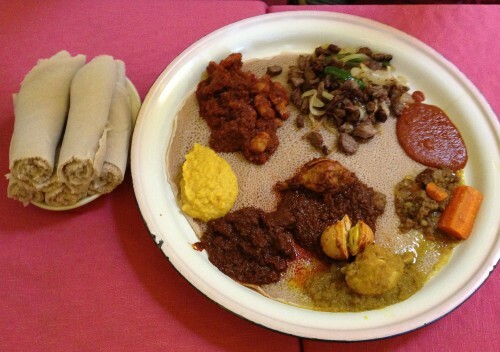 Ethiopian dishes use a variety of spices for their characteristic taste. Watt is a stew-like dish that can be made with beef, lamb, chicken, and vegetables. The dishes can be mild or hotly spiced with berbere, a typical Ethiopian red pepper sauce. The more delicately seasoned stews are called alicha which contain no berbere. Fitfit is a combination dish prepared with broken bits of the injera. Zilbo - Lamb chunks, collard greens, and potatos seasoned in a mild sauce.